Orange tabby cats are like sunshine. They brighten up every room with their mere presence! And they surely cheer up the lives of the humans around them. So what is so special about ginger cats? Is it their lively color? Orange is a happy color, that’s for sure. Or could it be their sunny disposition? I’m not sure all orange tabbies have a merry and easygoing personality. Case in point, one of my childhood cats was an orange cat, and he wasn’t the chirpy or mellow type. He was aloof and reserved. Indeed, he'd rather sunbathe in the garden than to socialize with us humans. But I still loved him and enjoyed petting him (when he was in the mood). His name was Garbanzo, which means chick pea in Spanish. On the other hand, one of my friends has one of the sweetest cats I've ever met, and he's an orange kitty. 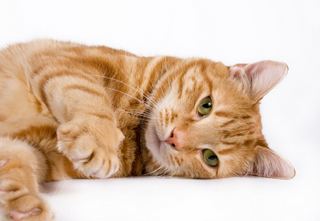 Here are some fun morsels of information about the orange tabby cat. --What is a tabby cat? Tabby is not a breed and it’s not a color. Tabby refers to a coat pattern. So a tabby cat has a distinct fur pattern that may include spots, stripes, swirls, and whorls. Tabbies come in different colors, including orange. --Tabbies come in four patterns: classic, mackerel, ticked, and spotted. --Most orange tabby cats are male, but you will find a few "red-haired" female cats. --Why are most orange cats male? Genetics is responsible for that. Let me explain. The X chromosome carries the "orange" (or red) gene. Male cats have one X chromosome while females have two. While a male needs only one orange gene, a female needs two. So males have a higher chance of being born with flaming fur. --Orange cats have freckles on their nose. --Orange felines are also called red cats, ginger cats, and marmalade tabbies. --Orange and white is a common color combination among orange cats. --There are no solid-orange cats! They’re all tabbies. Some "red cats" may look as if they have no stripes or spots, buy they do. You just have to look very closely. These are some of the best known ginger cats. --Morris the Cat, the face of 9 Lives, the commercial cat food. -- Heathcliff and Garfield are very famous orange cartoon cats. --Two beloved literary orange cats are Thomasina, the protagonist of the book The Three Lives of Thomasina by Paul Gallico (which by the way was made into a movie), and Orlando from The Marmalade Cat, a series of books by Kathleen Hale. --And from the world of TV we have Spot. This orange kitty was the pet of Data, the android from Star Trek The Next Generation. --And who can forget Thomas O’Malley, the suave cat from the Disney movie The Aristocats? What a cool kitty! You will find lots of items featuring orange tabbies, including posters and art prints, calendars, and stuffed toys. By they way, take a look these pictures of orange cats. If you have an orange cat and want to make your own gift, use your cat’s pictures to create your own art. You can also use those pictures to personalize different types of items like mouse pads, magnets, and tote bags. Just go to zazzle.com for more information.